Why should I use Vendio USPS® Integration? What are stealth labels, and why do they benefit me? Stealth labels allow you to hide the actual shipping cost from the buyer. This prevents disputes over minor shipping amount discrepancies and helps keep buyers happy. Vendio USPS® Integration (Powered by DYMO Endicia) is just $15.95 per month. This amount will appear on your Vendio bill and will be added to the monthly amount you pay to Vendio. Note that the (discounted) postage you purchase through Vendio will be billed separately by Endicia, on whichever credit card you enter during the Vendio DYMO Endicia registration process. Which shipping methods are supported? Vendio USPS® Integration currently supports all domestic USPS® services, including USPS First-Class, Priority, Express, Media Mail, Parcel Select, and Standard Post services. In your Vendio account, go to Orders > Sold Items, and click the Ship button. Click the "Set up USPS® Integration" link under the Ship menu. Or click here to access the setup. 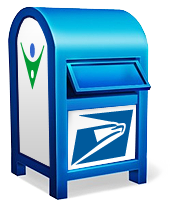 For detailed instructions, click here to download our USPS® Integration Guide. Can I use an existing DYMO Endicia account? To establish the integration with your Vendio account, you need to create a new DYMO Endicia account through the Vendio signup flow specifically for use with Vendio USPS® Integration. You can, however, keep your existing DYMO Endicia account as long as you wish if you want to use any remaining postage balances or for access to past shipping records. Labels can be printed in bulk on both dedicated label printers, such as the DYMO LabelWriter 4XL, as well as standard laser printers. What label types and formats are supported? By default, Vendio USPS® Integration generates labels in the 4" x 6" label format typically used with dedicated label printers. Labels are also scalable for batch printing on most laser printers using laser-printable shipping labels (such as Avery 5126 and 5168), or using standard 8.5" x 11" printing paper.